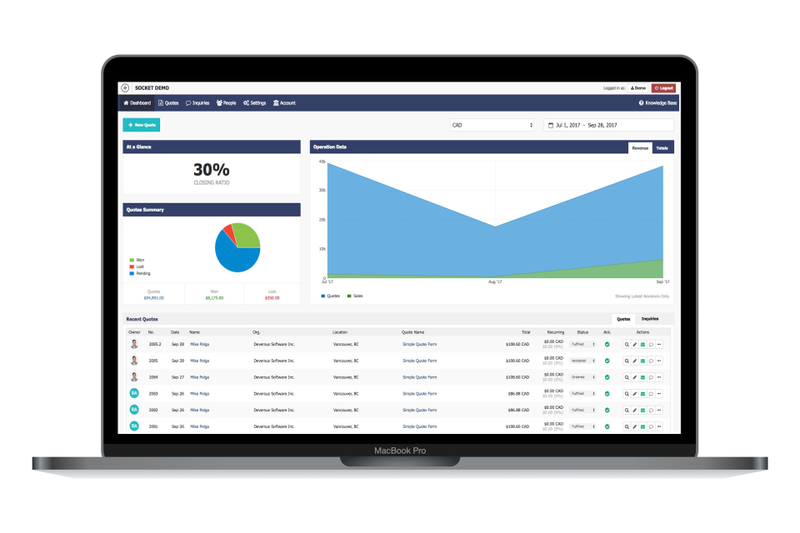 Pros: We looked at tested out over 30 different companies offering CRM and Quoting Software. Our biggest need was the ability to be able to send a single quote with one time fees and recurring fees on it with a separated breakdown of each charge and product line (one time fee vs recurring). SocketApp was easily the most practical, user-intuitive option out of all of the different software we demo'd out. Cons: There's really no cons to speak of. The only negative aspect of this software is that when a customer accepts an estimate from SocketApp and esigns for it and Quickbooks integration is synced the software automatically creates an invoice. Pros: Perfect quotes time and again, zero errors. Easy to set up and use. Powerful integrations. Exemplary support. Cons: None, however we look forward to possibly an App for mobile devices in the future. Overall: We have used Socket for over 4 years now. Thousands of perfect, effortless quotes later, we have no choice but to rate this 5/5. If we could rate it higher, we would. Pros: We use Socket for our quotes and absolutely love the integration with Infusionsoft. There is a contact lookup feature so when you search for someone's name the Infusionsoft record comes up, and you can apply Infusionsoft tags when the quote is sent and when a customer accepts the quote. Cons: Up until now, the reporting hasn't been as detailed as we would have liked, however, Socket is due to release a new reporting dashboard so we are looking forward to seeing what it will be like. Overall: Fast and easy to use quoting software that allows up to produce professional looking quotes that we then integrate into a PDF document. Pros: The initial setup time and template creation is quick and easy. Copying templates are simple, adding items on the fly easy and the summary section of the quote pricing is perfect. Cons: The ability to add sections on the fly would be great but not critical. We currently have to create templates based on recipient level and would be awesome to add sections like items. Overall: We had a huge issue with standardizing on pricing and adjusting the prices on the fly. We were also using products that were cumbersome to change and navigate. I stumbled upon socket through a web search and the pricing initially grabbed my attention then the features won me over. We have been using socket for over three years and extremely happy with the product. Pros: This is the only cloud-based quoting program that integrates with Hubspot effectively and handles complex products well. Other quoting programs have simplistic product catalogs. With Socket, I've been able to create items/products that can be easily configured. For example, if you sell a product that is like a car and has various optional features to choose from, this quoting software allows you to easily construct those products and make it easy for your sales team to quickly and easily quote. In addition, Socket allows you to give Distributors controlled access to be able to do quotes and you can even connect Socket to your website so a prospect/customer can create their own quote. With the Hubspot integration, you can dump all of the data directly into your CRM for further follow up by your sales team. Cons: I'm a big fan of the software. No major shortcomings for us, just some ongoing refinements. On our wish list would be to be able to add items to a quote that are listed as "optional" but aren't figured into the overall price total. Overall: Improved sales efficiency and more effectively integrate quoting into your sales process (especially if you use Hubspot). In addition, provides additional strategic capabilities to integrate with your website and include your distributors. Socket has been great for the last 4 years. Pros: Easy to use, flexible, turn-key. Cons: Not any that they haven't already addressed. Overall: We have been using it for the last 4 years and have loved every minute of it. They provide amazing service and support, and best of all our customers and dealers love it. Because it is so user friendly, we continue to find new products and services to add to our portfolio. Keep up the good work! Recommendations to other buyers: It's a great product. Easy to get up and running and flexible enough to customize it as much as you need. Pros: With Socket, it takes very little time to build custom quotation templates that streamline and automate the process of creating customer quotations. We like the fact that some templates can be publicly accessed while others are privately accessed. Cons: We really have nothing to complain about in terms of the program, which has been 100% reliable. The management people at Socket have also been very open to suggestions and as a result, we see improvements and enhancements being added each month. Overall: GPS Commander provides GPS Tracking systems to commercial organizations throughout North America. As most of our business comes directly as a result of our website at www.gpscommander.com, we strive to make our product and pricing information as accessible and easy to follow as possible for prospective new customers. The GPS tracking business is ultra competitive, so we believe that having a friendly, accurate and professional online presence is a key to our success. For these reasons, we chose Socket's online quoting software solution for its unique ability to combine professional automated customer quotations with full eCommerce capability. Socket has become a key part of our business due to its ability to generate and track all of our online quotations and leads, as well as its ability to facilitate online orders. It even integrates to our CRM program for lead tracking. Another key benefit is Socket's ability to automate our recurring credit card transactions each month. Awesome product! Very Easy to use! Pros: The Ease of the Price Book entry. The template works very well for our needs. The support staff has been awesome along the way helping me with the learning curve of making changes in the way we wanted the template quote to look and work for us. The support person i have been working with did a few webinar sessions and we went thru all of our questions and she found a way each time to resolve them during that session. We love the email tracking feature. This was a plus for us. Cons: I would like to be able to put the website link for each of our products in the excel price book then be able to import them into socket and still have the link be a usable link. instead of having to import, then open each item up, add the link & then save it. Overall: Socket has been awesome to work with. It is very easy to use and easy to import product price books. We are very happy with it and the pricing is awesome for what it can do. the Email tracking feature is a plus! Overall great experience with this software & support. It makes generating quotes easy and fast. Pros: Customer support! Whenever we've had a question, customer support from Socket has provided us with clear, useful, quick and accurate responses. The Socket staff has been very accommodating to our needs along the way. We feel we can depend on them and they are easy to get in contact with. 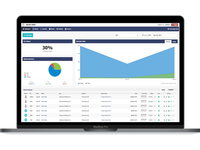 We also like that the product integrates with our Infusionsoft CRM software. Cons: It's a little bit clunky as far as doing specialized formatting. It was a challenge to add our tightly formatted standard terms & conditions page to the end of the quote; but again, with Socket's help, we were successful in accomplishing it. They also assisted with formatting a specialized cover page using our logo. Overall: Ability to easily make fast, accurate quotes for our prospects and customers. Cons: I sometimes need to search for things, when I want to change things, I would like to have a possibility to email all the customers, who did not pay to send an email at once. Pros: Ability to support recurring and non-recurring products. Fantastic integration features. Cons: Not being able to change the template used when modifying a quote. Overall: I have worked with numerous quoting platforms over the years. Each quoting package had a few features that I really liked but never have I experienced a product as well rounded as Socket. The functionality and impeccable support have confirmed this to be the best decision we could have made. Our clients enjoy a clear and easy to understand quotation, the speed at which we are able to respond to quotation requests, and streamline electronic delivery and acceptance. 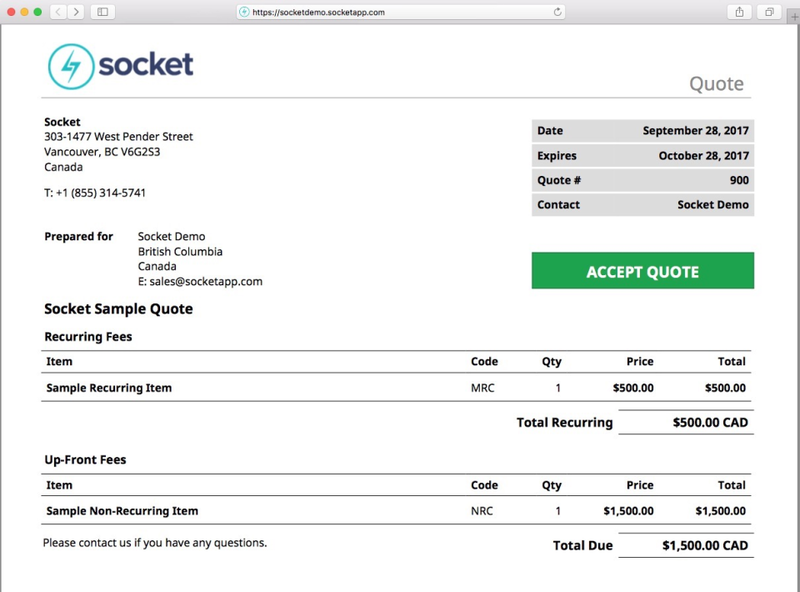 Not only has Socket removed the burden of creating a great quotation, they have simplified the process following order acceptance with payment gateway and CRM integration. Gone are the days of double data entry. Thank you Socket! Recommendations to other buyers: This product is second to none. It is so easy to setup that you can give it a good evaluation with little effort. Pros: It does everything I need it to (and more), and is backed by one of the best services teams I have ever seen. Cons: I honestly cannot say - everything that was not perfect they fixed and tailored to me. Overall: Looking for a flexible online quoting solution I researched a lot of options, as most of you would. Socket seemed to have everything I needed, so I tried it out. The response time of the sales and service team was exceptional. And even though I only initially signed up for the low end plan, they treated me like a high end client - going so far as to expand one of the data entry fields because I kinda sorta thought it didn't quite suit me. I have never seen that level of customization and willingness to make change - and they did it in about an hour. I couldn't even get my own IT team to respond that fast to me. Recommendations to other buyers: If you think something can't be done, ask. It likely can be done; or they will find a way to do it for you. Pros: There was the so many capabilities which is exciting because the invoices can be very tailored to your business! The invoice itself looks professional and very tailored to each project/proposal, etc! Overall: I can't say enough good things about this product and customer experience!! From the first moment I started using Socket, the team was helpful, friendly, and very willing to teach me how to use socket to optimize my business. The more I use it, the more I like it! 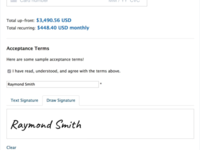 There are so many capabilities to this software so the possibilities for tailoring my quotes/invoices are limitless! I'm very happy that I chose socket and am able to use such an amazing product and recieve such incredible tech and customer support. Pros: flexibility and integration with Zoho. took me almost no time to generate quotes right away with no training. Cons: It's expensive for a one person company, pricing model is based upon number of quotes generated rather than a per user all in price. Overall: Looked at over 10 quote tools online and all of them did not provide enough flexibility. We did not want to change the way we did business to meet many of the online quote tools. SocketApp has a solid foundation for quoting just about anything. We use Zoho as our CRM and the integration was key to our decision to use Socket App. SocketApp has excellent support, whenever I call I always get through to someone which is paramount for a small business. Recommendations to other buyers: Do your research, make sure you try SocketApp out, use it right off the shelf don't hold back on asking questions and support. Easy to configure. Easy to implement. Attentive and proactive assistance. Comments: After years of Word and Excel quotes. I HAD enough! I was determined to find a tool that was easy to initially set up and configure for complex quotes and easy for the sales team to use. Upon first use, I was immediately impressed with their outstanding support and the tool's flexibility. Our three person sales team generates up to 5 complex quotes per day. The Socket Team has created a tool that allows us to create complex quotes in a few button clicks! Initial configuration was very easy, about a day's work. The interface is intuitive and clean. There has not been a situation where I could not configure the quote to my exact needs or the customer requirements. Every time I ask the support team a question, I get an immediate response. Every morning I open Socket and Highrise. I create quotes in Socket and track correspondence and tasks in Highrise. The combination of these two tools gives us quote history, a chain of customer correspondence, and action items. Going back to Word or Excel would be like cutting off the sales team's arms, hands and legs!! Socket has given me HOURS more that I spend on maintaining our prospective customers. Pros: - Deeply customizable for crafting beautiful proposals and quotes via templates. - Extensive integrations for QuickBooks, CRM, PSA and distributors such as Ingram Micro and Tech Data. Cons: There is nothing that I dislike - Socket does everything that we need it to do. Overall: I cannot say enough great things about the team at Socket - excellent, forward-thinking product along with excellent customer service. Socket has truly been a game-changer for our salesforce - it has streamlined our processes and saved valuable time. Pros: The cost was minimal per person. Ease of setup was very easy. Day to Day usage from relatively easy. Cons: Socket has no customization at all. The biggest challenge we found is that each line item would not display its discount. Ex: if MSRP and customer discount was 50% off, it didn't show the cost for that line item. The discount was shown below the subtotal in the bottom of the quote. So if customers needed line item pricing, they had to do math on the individual lines. Best customer service on the market. Pros: Powerful 2-way integration with CRMs, examplary customer service, professional looking quotes, easy to use (our salesmen love it) and most of all, they listen to the customers to know which features to add next. Pros: Easy to manage product list. Building a basic quote template is a straight-forward process. With just a little help from support, you can create a customized template to produce professional proposals. Cons: Using the search criteria to add items to a quote requires knowing the name (or part of the name) of the item. Overall: Socket has allowed us to streamline our quoting process by reducing time and providing a centralized place to manage the data. The ability to see quote margins is very helpful. Comments: I highly recommend using Socket. The application is very user friendly, cost effective, and the customer service is top notch. I have worked closely with them and have never been let down. They have made themselves available at moment's notice every step along the way. Customer service is off the charts...5+ stars! Pros: Socket makes beautiful quotes in minuets. It has a unique ability to give good clear easy to use cost breakdowns between recurring services and transactionable items on a single quote. Cons: no cons that we have found so far. Would be nice if the dashboard gave a breakdown between recurring and transactionable - but in the grand scheme of things that is very minor! Overall: Must quicker , cleaner, easy to read quotes. Cons: You still have to work the way the product was designed so we had to adapt our process to fit Socket in some cases. But for the price, it worth it! Pros: Easy to use and setup. Great quality quotes, and the ability to break down recurring charges and one time charges is great. Cons: The additional cost for a company that does a high volume of quotes in another CRM makes it tough. The CRM integration is improving, but still requires too many moving pieces to the sales process. Overall: The company stands behind their product. They work with you to make sure you are well trained and able to implement the software into your business. The quotes are very high quality and customers are really impressed when they get them. The improvements in the integration with CRM's makes it an even better value. Pros: It is very easy to use Socket for quotes, very straight forward. Also makes it easy for our company to track the process of acceptance and payment of quotes. Cons: I have not yet experienced any problems with the software. I have only used it for less that 6 months, but I am very happy with it so far. WOW! So Fast and Flexible! Comments: When we launched our company we were generating Excel quotes with a very loose sign-off process for new customers. 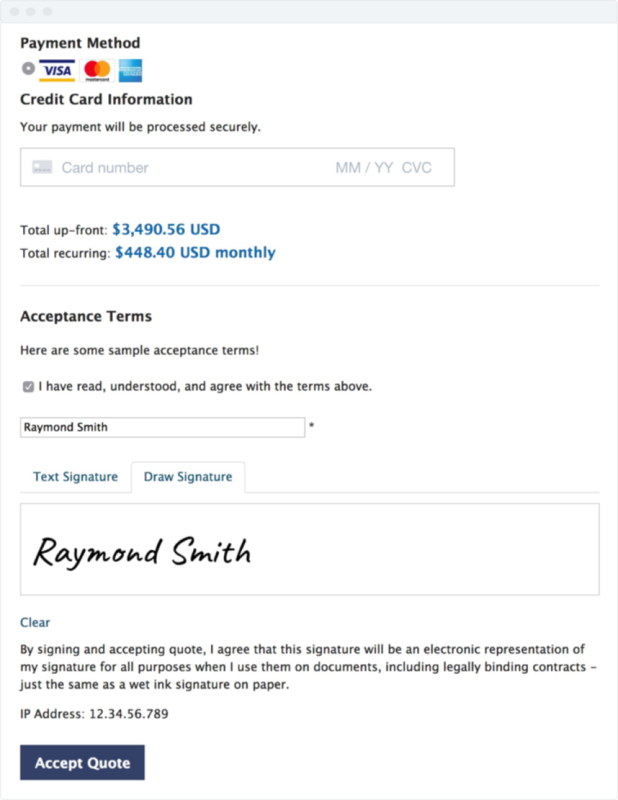 After implementing SocketApp, we were able to cut our sales quoting time from 1 hour to 1 minute while creating a more professional and legally binding quote sign-off process. The integration to Stripe has also saved our accounting team a tremendous amount of time. I love being able to control all off the labels and messages that go out. This helps to align the quoting language with our values / terminology. Great product, service, and response time! Comments: I have nothing but positive things to say about Socket. Anytime I have an issue or question, Matt is on it right away with a fantastic response time. The entire product is constantly getting new updates to make it better than the great product it already is. Socket is constantly improving itself for the better and employees are dedicated to delivering satisfactory products. Great software, service, and overall experience. 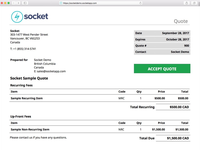 I would recommend Socket to anybody looking for a reliable and professional quote software! Cons: The rendering engine is a 3rd party and it does not insert page breaks and if a photo is too large then it completely screws up the output, or inserts many (15) blank pages. You cannot build rules, e.g. if weight of engine is greater than the max then display an alert. You can update the Parent prices via a csv file but you cannot upload the child parts (even if they have a SKU via an upload) this would save 100's of hours when a new price book is released. Pros: Easily-configurable and flexible system. Friendly and helpful support. Responsive to customer needs. Transparent policies; no BS. Works well for small players and big businesses. Cons: I haven't received any Socket stickers or free t-shirt, yet. Overall: I'm a sole proprietor who provides internet services and also sells software licences of different types. By integrating Socket I have been able to streamline sales of these products to a wider audience, augmenting my existing sales channels, with very little effort. Comments: I'm a sole proprietor who provides internet services and also sells software licences of different types. By integrating Socket I have been able to streamline sales of these products to a wider audience, augmenting my existing sales channels, with very little effort. Pros: This program is easy to set up and even easier to use. The support from the reps is unmatched. I would 100% recommend this program to anyone.